In Costa Rica, Poas looms to the north of the airport. A big mound of a mountain, the roomy crater hidden in the clouds. It can be seen from the window of a plane, the turquoise, unwelcome water in the big hole briefly glistening in the sun. The rocky crater is framed in textured green, for folks on the plane, a distant, unreal broccoli carpet. There’s no indication of the true nature of that forest way down below, nor the other rivulets and waves of tropical forest that reach down the northern slopes of the volcano. The riot of life going on down there, Pumas and Ocelots doing their stealth dance beneath the wet canopy. 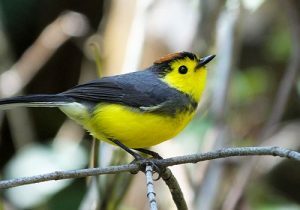 Bright and sunny Collared Redstarts singing from the bamboo understory, bush-tanagers and Yellow-thighed Finches rummaging through the bushes and trees. Bright and beautiful, one of many highland species endemic to Costa Rica and western Panama. 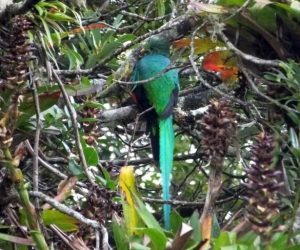 Quetzals are there too, whistling and cackling from the misty forests. But, as with any scene from a plane, it’s just a distant natural portrait, the only soundscape one of humming motors and occasional requests for coffee, the hiss of sugary carbonated drinks poured over ice in a plastic cup. 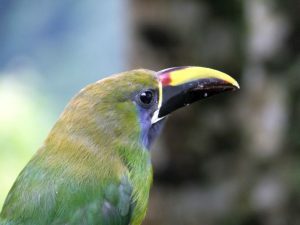 We only truly experience the forest on Poas and anywhere else with boots on the ground, can only get lost in the quick variety of mixed flocks, fluttering of quetzals, and the air scything ability of swifts by walking with those trees. The sacred bird is up there on Poas, according to locals, not as common as it used to be but it’s still there. I was surprised to see one after another flutter between trees until I had counted six including the male pictured above! Not in the high parts of the mountain but present along a roadside stream much lower down. 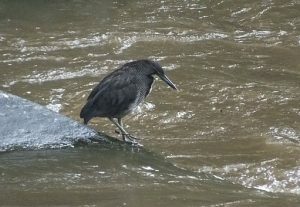 The heron of rocky Neotropical streams posed nicely for us as it blended into the dark gray river stones. 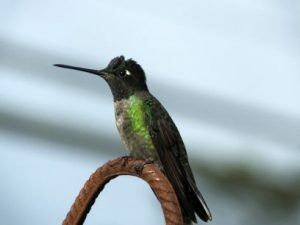 From Fiery-throated in the high parts to glittering Crowned Woodnymphs past Cinchona, hummingbirds are a welcome mainstay on Poas. 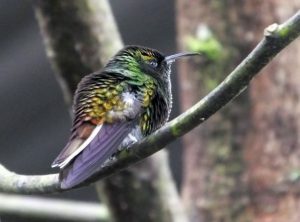 Including a Steel-vented near Alajuela, we had fifteen species. 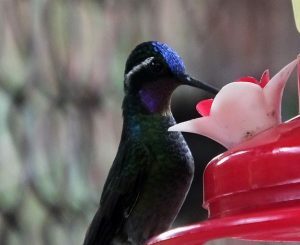 Visit the Soda Mirador de Catarata (aka Cafe Colibri, aka the Hummingbird Cafe) to spend quality time with this exotic beauty. Not so common but this bromeliad bird us indeed present along the higher parts of the road. If you see a silhouette of one, this image shows what to expect. Not rare but skulky and always cool to see four or even five species in a day, most at different elevations. We had good looks at four and without too much trouble. 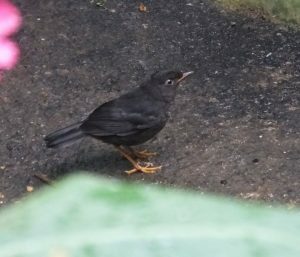 This is a juvenile Slaty-backed N.-Thrush that was visiting the Cafe Colibri. A few were singing and showed nicely. 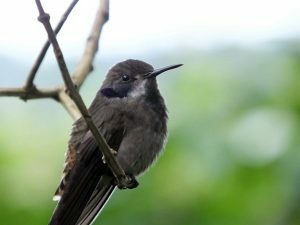 These were some of the one hundred plus species we saw on the slopes of Poas the other day, each stop adding more birds to the list. Many more were still possible and some calling birds remained unseen but any day spent birding is a good one. 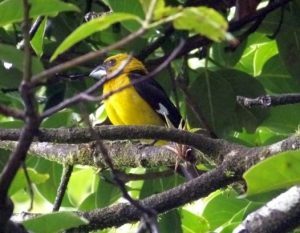 A day with more than a hundred species is even better especially when the birder can walk within reach of old, mossy trees frequented by quetzals, treerunners, and other cool birds with fantastic names. On Sunday the 26th I had the privilege to go for birdwatching the whole day with Pat. We saw many fantastic species thanks to Pat’s excellent knowledge. Thank you for this unforgettable day! 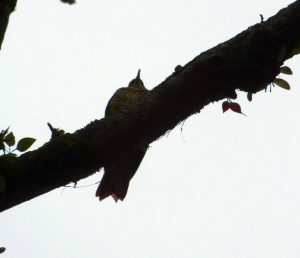 It’s not often that you see over 100 species on one day! Thanks again. @Roy- A memorable day, thank you for your kind words. Hi, I am an Alajuela resident & would dearly love to see a Quetzal on the road side area leading to Poss. Is Pat contactable by email?